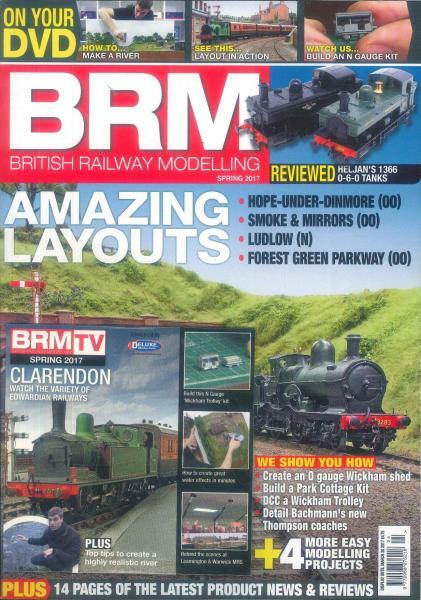 British Railway Modelling Magazine is the UK publication for model railways hobby enthusiasts. Buy a single copy or subscription to British Railway Modelling magazine. The magazine was founded in 1993 and provides monthly information on new model railway kits, conversion projects, railway layouts, scenery and structure modeling, beginner’s information, and reviews of new products. It covers all scales of railway models including OO gauge, N gauge, O gauge, and others. There are detailed photographs and inspirational articles from experience railway modelers and historical sources of information on train formations and railways of the past. Recent issues have included articles on how to pick the correct soldering iron for railway modeling, adapting a resin building, building a buffer stop from scratch, how to convert ad Network Rail coach, and instructions on constructing a Leicester South Warehouse. You will also find information on model trains including Bachmann, Graham Farish, Dapol and Hornby. There are descriptions of new layout designs complete with diagrams and photos for 00 gauge 0 gauges, and N gauge. In all there are 25 plus pages of train layouts. In addition, there is information on upcoming model train shows and exhibitions, and discussions of past shows. Reviews of the new Lords & Butler 2EPB Limited Edition, the DCC Concepts Power Bus Supressor and the Graham Farish WD Austerity are also included. If you love model trains, and are interested in the learning more about the hobby of railway modeling, you will want a subscription to British Railway Modelling.